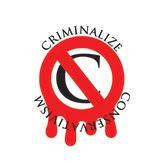 Criminalize Conservatism: Take The House Back In 2014! Take The House Back In 2014! 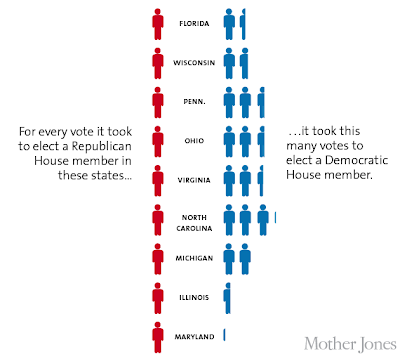 Voter suppression and gerrymandering are the keys to the Congressional elections in 2014, and only a concerted effort to increasing the voter turnout in even larger numbers than the 2012 election will bring the GOP House membership down. Ian Gray's article in the Huffington Post, "Jim Greer, Ex-Florida GOP Chair, Claims Republican Voting Laws Focused On Suppression, Racism," reveals an undisputable fact: Conservatives are guilty of voter suppression and racism. A corollary to that fact is: They'll will never stop practicing these criminal activities at the voting booths if they are the only way that they can win elections. "Jim Greer, the former head of the Florida Republican Party, recently claimed that a law shortening the early voting period in the state was deliberately designed to suppress voting among groups that tend to support Democratic candidates, the Palm Beach Post reports. "The HB 1355 law, which was passed by Florida's Republican legislature and signed by Gov. Rick Scott (R) in Nov. 2011, cut the number of early voting days from 14 to eight. It was publicly sold as an effort to reduce voter fraud and to save money, but Greer says that this was simply a "marketing ploy." "Greer served as Florida's GOP chairman from 2006 until 2010 when he was forced to resign after allegedly stealing money from the party. He was arrested and his case is pending. 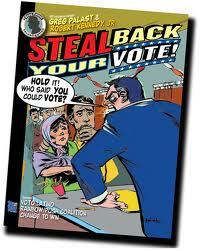 "Crist said the new law is clearly aimed at curbing turnout among Democrats. "Greer also acknowledged that the effort to restrict early voting would directly affect turnout among Florida's African Americans, a demographic that consistently supports Democrats. 'The sad thing about that is yes, there is prejudice and racism in the party but the real prevailing thought is that they don’t think minorities will ever vote Republican,' he told the Post. "Greer went on to suggest that there was 'absolutely nothing' state Republicans wouldn't do in following their 'absolute obsession with retaining power.'" "Americans woke up on November 7 having elected a Democratic president, expanded the Democratic majority in the Senate, and preserved the Republican majority in the House. "So how did Republicans keep their House majority despite more Americans voting for the other party—something that has only happened three times in the last hundred years, according to political analyst Richard Winger? Because they drew the lines. 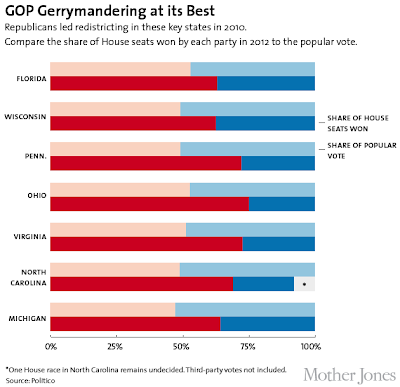 "After Republicans swept into power in state legislatures in 2010, the GOP gerrymandered key states, redrawing House district boundaries to favor Republicans. In Pennsylvania, Democratic candidates received half of the votes in House contests, but Republicans will claim about three-quarters of the congressional seats. The same is true in North Carolina. More than half the voters in that state voted for Democratic representation, yet Republicans will fill about 70 percent of the seats. Democrats drew more votes in Michigan than Republicans, but they'll take only 5 out of the state's 14 congressional seats. "Redistricting only happens once every 10 years. So Americans may have to learn to live with a Republican House, no matter how they vote. Too many of us sit back during off-election years, as well as off-Presidential election years instead of joining our local political party precincts and working to get out the vote. The White House has said that the President will be making use of his online supporters' list to use the collective power his supporters have across the country, something he should have done after winning the 2008 Election. There is no doubt that the Conservatives in Congress will continue their criminal ways in their War On Democracy, should their tactics remain unchallenged and the low percentage of voters be maintained. They have continued their relentless power grab for decades and show no inclination to stop their criminal behavior in the seats of power nor in the voting booth yet - and never will. We can only hope that the White House is aggressive enough in registering vast numbers of non-Conservative voters to overturn the GOP House majority in 2014. From there it is just a step to finally criminalizing Conservatism for all time.